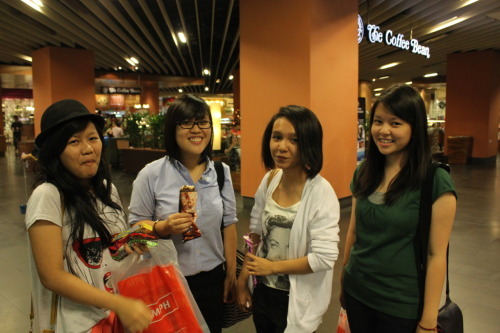 Hanna, Mei, Effie and yours truly. Hanna, Ellie, Effie and yours truly. It’s the weekend! It’s the weekend! 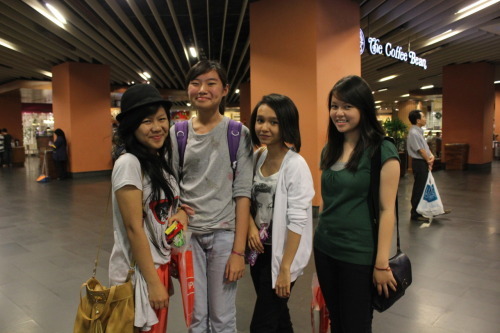 I went to a sort-of Tumblr meetup at Gardens today to meet all these lovely people: Ellie, Effie, Mei and Hanna. I also bought Extremely Loud and Incredibly Close by Jonathan Safran Foer and Delirium by Lauren Oliver. Effie gave me two incredibly lovely notebooks which I am in love with. I gave Ellie and Effie my owls! I apologise for my introversion the whole 4 hours we were there but I had a really good time! My verdict for everyone: Everyone was lovely, and I’m not just saying it. Also, thank you Effie for the ride home.